Editor’s note: On January 14, DC’s Circuit Court of Appeals found that the FCC does not have the authority to impose its net neutrality rules on Internet service providers. Read on to learn what that means for the future of the Internet. Over the last decade, net neutrality has increasingly made its way into public discourse: politicians on Capitol Hill have battled over it, corporations have worked to curb it and public interest advocates have fought to preserve it. In September, the fight to keep the Internet free and open found its way to the DC’s Circuit Court of Appeals, where Verizon is attempting to overturn the Federal Communications Commission’s current net neutrality regulations. Verizon vs. FCC, which could be decided as soon as this month, is the latest and arguably most important battle to protect the Internet from censorship and discrimination. But what is net neutrality? And what could this case mean for the future of the Internet? We’ve put together this explainer to catch you up. Network neutrality, or net neutrality, is a term first coined by technology policy scholar Tim Wu to describe the preservation of online innovation by prohibiting companies from discriminating against some users and content, or prioritizing some content over others. 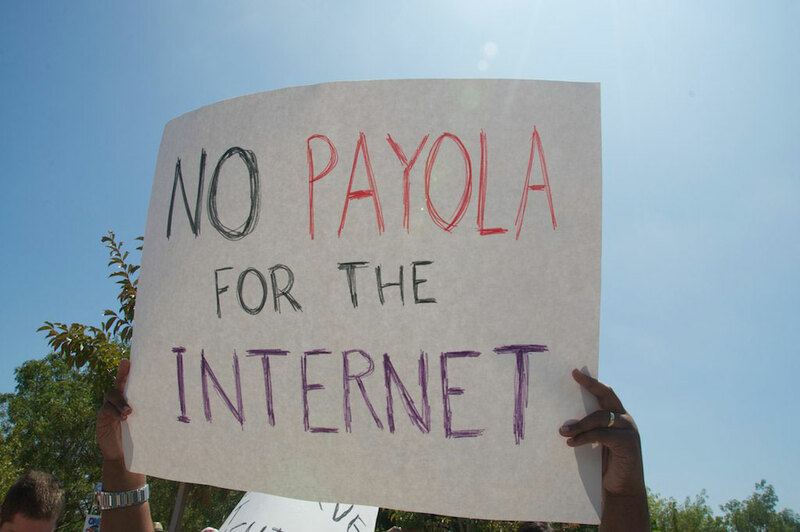 It guarantees a level playing field in which Internet users do not have to pay Internet service providers more for better access to online content, and content generators do not have to pay additional fees to ensure users can access their websites or apps. By the way, what is an Internet service provider? An Internet service provider, or ISP, is a company or organization that sells you access to the Internet. These companies, like Comcast, Verizon, Time Warner Cable or CenturyLink, do not own the Internet, they just provide the infrastructure needed to access it, like underground fiber optic cables. It’s a lot like how your local water company doesn’t actually own the water you use, they just own the water pipes. Is net neutrality a new concept? No. The first innovators of the Word Wide Web intended for Internet to be non-discriminatory and fair to all users. Tim Berners-Lee, the inventor of the Web, is a staunch supporter of net neutrality regulation and frequently makes public critiques of companies who aim to violate it. Now, what happens without net neutrality? Without net neutrality, your Internet service provider could block or slow online content, depending on which websites or apps they wish to preference. For example, an ISP might speed up your access to NBC.com, but slow or degrade your access to AlJazeera.com. They could also charge different prices for different content. An ISP might charge NBC.com more to host last week’s episode of Parks and Recreation than to feature an article about it. Internet service providers could also charge fees to Internet companies for providing that content to you. They might, for example, begin charging Netflix a fee for carrying online video over its network, which it likely will pass on along to its customers. Yikes, that sounds awful. But is this threat just hypothetical? No, there are some limited regulations to protect net neutrality (more on those later), and companies have already violated them. For example, in 2005 the FCC fined Madison River Communication, a North Carolina–based ISP, for blocking Vonage, a telephone company that provides Internet-based telephone service. Madison River said the company was a “competing phone service” and blocked their calls to more than 200 customers. In 2008, the FCC voted that Comcast violated the law by slowing user traffic to BitTorrent and other peer-to-peer networking sites to free up bandwidth on its network. In 2010 an appeals court sided with Comcast, ruling that federal regulators have limited authority over Internet regulation, but the company honored the FCC’s decision and agreed to stop blocking BitTorrent traffic. More recently, in 2012, AT&T announced it would block FaceTime, Apple’s mobile video chat function, from its devices unless customers buy a family plan, which is more expensive. Public interest groups filed a complaint with the FCC saying the move violated net neutrality rules. In 2013, the company unblocked the application for all users except those who have unlimited data plans. Since then the company has agreed to slowly enable FaceTime and other video calling apps. And in May 2013, The Wall Street Journal reported that ESPN is considering a contract with at least one major cell phone provider to pay extra to exempt its application users from data caps, which are arbitrary limits that cell phone providers put on your data usage. The announcement has public interest advocates calling on the FCC to reign in this breach of net neutrality rules. Wait—what is the Federal Communications Commission? The Federal Communications Commission, or FCC, is an independent government agency that was created by the Communications Act of 1934 to oversee everything from radio and TV licenses to subsidized telephone service programs. The agency is made up of five commissioners appointed by the President and approved by the Senate to serve five-year terms. The President also chooses one commissioner to serve as the chairman. The FCC enforces both the Communications Act of 1934, which consolidated existing regulations for the radio, telephone and television industries, and its updated and reformed version, the Telecommunications Act of 1996, which relaxed rules around media ownership and universal broadband service for schools and libraries, in addition to weakening regulation of telephone services. How do these acts regulate communication? Are Internet service providers considered common carriers under Title II? No. Internet service providers are classified under Title I of the Communications Act as providing “information services.” Title I says that no discrimination or price regulations of information services are “necessary for consumer protection” and the commission can’t regulate those services. However the FCC does have “ancillary jurisdiction” to regulate interstate and international communications, which means the agency has some indirect authority to regulate these networks. Why isn’t the Internet protected under Title II as a regulated “telecommunications service”? In 2002, the FCC under the Bush Administration ruled that cable broadband should be classified under Title I as an information service and should not be subjected to regulation, in order to ”encourage new investment” and market competition. In June 2005, in a 6-3 decision, the Supreme Court upheld the FCC’s classification of cable broadband as an information service, ruling that incumbent ISPs do not need to let smaller competitors, like EarthLink, connect to their networks. In August of that year, the FCC ruled to classify DSL Internet as an unregulated information service in order “to preserve the vibrant and competitive free market that presently exists for the Internet.” That left our modern-day Internet unregulated by common carrier principles. Has anyone in the US attempted to establish net neutrality rules? Yes, the FCC issued an Internet policy statement in September 2005 that attempted to ensure ISPs “operated in a neutral manner” by offering consumers choice in content, providers and devices. But because it was merely a policy statement, it came with no enforceable rules. In 2006, Republican Senator Ted Stevens of Alaska introduced a failed bill that would have prohibited ISPs from blocking traffic or applications. It would have also tasked the FCC with studying net neutrality for five years and handling net neutrality complaints. What movement on net neutrality has happened since Obama took office? The FCC shifted to the left after Obama’s 2008 campaign, which included a net neutrality platform. Obama appointed Julius Genachowski, a lawyer and media businessman who had previously served on the campaign’s technology policy working group, as the commission’s new chairman in 2009. With a new, more liberal chairman and a pro-net neutrality president in office, the FCC began the process of introducing net neutrality rules in October of 2009. In August of 2010, Google and Verizon released a joint policy proposal intended for the FCC as a framework for net neutrality rules, emphasizing self-regulation on broadband Internet. This proposal called for stricter net neutrality regulations on wired Internet services than on wireless Internet services and extremely limited regulation from the Commission. Four months later, in December 2010, the FCC adopted the Open Internet Order by a 3-2 vote. The order, which instituted relatively light net neutrality rules, imposed stricter rules on wired Internet services and weaker rules on wireless services, just as the Google and Verizon proposal had suggested. What are the rules in the FCC’s Open Internet Order? Wired Internet service providers, like your broadband Internet at home, are prohibited from blocking content, must disclose their network management practices, terms and conditions and are prohibited from prioritizing some traffic over others. On the other hand, mobile broadband providers, like your cell phone carrier or wireless internet provider, are only required to disclose their network management practices and terms and conditions of their service. These orders fell short of public interest goals to protect consumers, as people are increasingly accessing the Internet via mobile devices. But they also extended too far for some conservative congress members and companies, like Verizon. Why did Verizon take the FCC to court over net neutrality? Shortly after the order was instituted in 2011, Verizon sued the FCC saying that the commission does not have regulatory authority to impose net neutrality rules on any Internet Service Provider. After two years of legal filings, oral arguments for Verizon vs. FCC began in the US Court of Appeals for the District of Columbia Circuit in September. What happened in the oral arguments? The FCC argued it had ancillary authority, or indirect authority through the Communications Act, to impose net neutrality rules. They cited Congress’s instructions in the 1996 Telecommunications Act, which requires the commission to promote broadband deployment and adoption across the country. The FCC argued that they need net neutrality rules in order to meet this requirement. They also strongly disagreed with Verizon’s First Amendment argument, saying that it would violate consumer choice if the company blocked or degraded connection to some websites over others. “Verizon has made clear over and over again that it is a conduit for other people’s speech,” said FCC lawyer Sean Lev. The judges seemed to agree that, through the 1996 Telecommunications Act, Congress had given the FCC some authority to regulate Internet Service Providers. There was, however, some discussion about striking down parts of the order or striking down the order in its entirety. Surprisingly, the judges seemed skeptical of the FCC’s argument against Verizon’s First Amendment claim. Judge Laurence Silberman gave the hypothetical of a website or application offering users chemical weapon construction lessons to be used against the United States. He said to Lev, under the commission’s view, “because Verizon is not a speaker it has no first amendment right to reject that message.” Some net neutrality experts said that this might have been the result of general confusion about how the Internet works and the role of ISPs as providing access to the Internet, not their role as owners of the Internet. After some back and forth about hypothetical First Amendment examples, Silberman seemed to confuse Verizon as a “conduit” of speech and as having its own content over its websites. Based on past similar court decisions, judges should make a ruling between this month and March 2014. If it is a loss for the FCC and the Court strikes down major provisions of the Open Internet Order, the Commission might appeal the decision and take the case to the Supreme Court. The FCC could also attempt to reclassify the Internet under Title II through a vote, which would give the agency the authority to regulate it. Already the question is bubbling in DC as Tom Wheeler, who recently succeeded Julius Genachowski as chair of the FCC, settles into office. A reclassification vote might be the first test of Wheeler’s commitment to an open Internet and the public interest. Leticia MirandaLeticia Miranda is a journalist based in New York City. She writes about race, technology and gender. Her work has appeared in a number of publications, including The Nation and Colorlines.com. Previously, Leticia has worked at the Open Technology Institute at the New America Foundation and Media Literacy Project in Albuquerque, New Mexico.